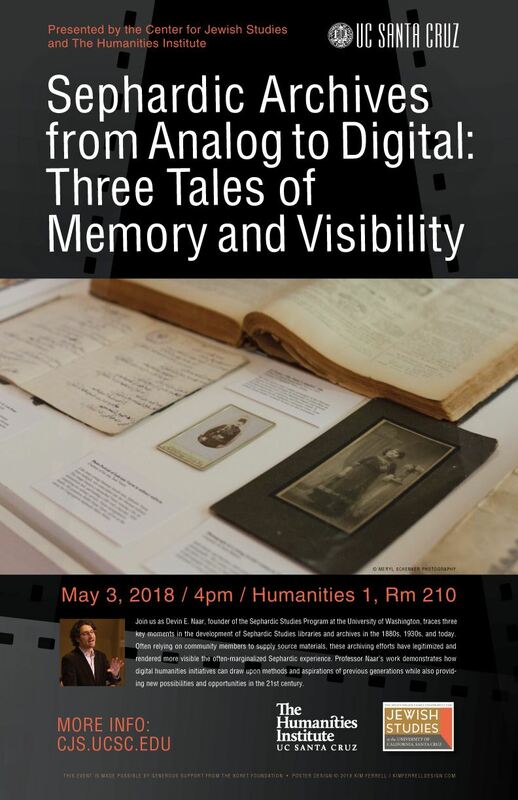 Join us as Devin E. Naar, founder of the Sephardic Studies Program at the University of Washington, traces three key moments in the development of Sephardic Studies libraries and archives in the 1880s, 1930s, and today. Often relying on community members to supply source materials, these archiving efforts have legitimized and rendered more visible the often-marginalized Sephardic experience. Professor Naar’s work demonstrates how digital humanities initiatives can draw upon methods and aspirations of previous generations while also providing new possibilities and opportunities in the 21st century. Devin E. Naar is the Isaac Alhadeff Professor in Sephardic Studies, Associate Professor in the department of History and the Stroum Center for Jewish Studies in the Jackson School of International Studies at the University of Washington. As the founder and chair of the Sephardic Studies Program, Naar oversees the Sephardic Studies Digital Collection, which has received support from the National Endowment for the Humanities. His book, Jewish Salonica: Between the Ottoman Empire and Modern Greece (Stanford University Press, 2016), won a National Jewish Book Award and the Keeley Prize for best book in Modern Greek Studies.